One of the hardest and scariest things to do in life is to do something you've never done before. On the flip side, it can also prove to be the most rewarding. As an example, who in their right mind would sign up for an Ironman, or ANY triathlon for that matter, who didn't know how to swim? Or even run?! Well, I DID! And as it turns out, it was one of the best decisions of my life and one that I am very proud to say that I did with Team In Training. Team In Training has changed my life in many wonderful ways as well as the lives of so many others through the millions of dollars we have been able to raise for cancer research. It is because of my experience with the TNT cycle program that I gained the confidence to sign up for triathlons not knowing how to swim. I knew that the coaches would be amazing and they would teach me the skills I needed to succeed. Race morning of my first triathlon! My very first triathlon was the HITS Triathlon Series Olympic distance. I was really nervous going into it because I had never done it before, but the TNT coaches and mentors were there with us every step of the way. They swam, biked and ran with us, making sure each participant made it to the finish. What an AMAZING feeling to cross the finish line at my first triathlon! 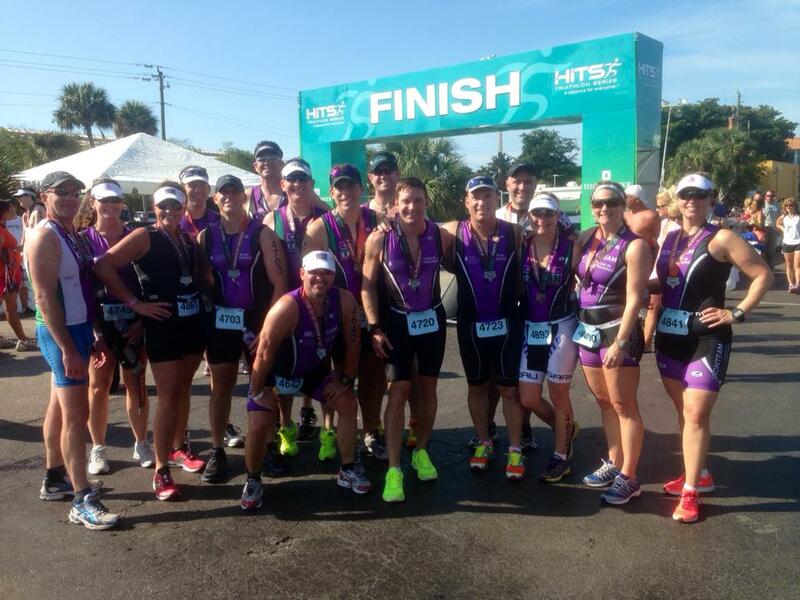 My team and I after finishing the HITS Naples Olympic distance tri. I couldn't be more excited to go back to compete in the this HITS race in Naples again with TNT and to now be mentoring! As a newbie triathlete I know it's doable, and based on my more experienced teammates from last year that loved the race I know it's a good one for seasoned triathletes as well. Wait, you still haven't sign up yet? Here are some facts/highlights that will maybe change your mind and, hopefully, convince you to join us! I honestly COULD NOT swim. In fact, when I did finally make it to the end of the 25 yard pool (after stopping to hold onto the side), I thought I was going to have a heart attack. The coaches never skipped a beat though! They were always positive, encouraging, and reassuring me that I could do it. 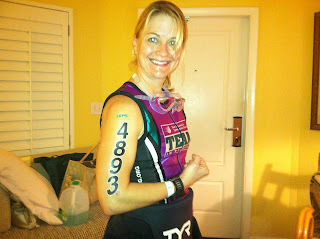 I had only been swimming for 4.5 months before my first triathlon in Naples. I had a GREAT swim in Naples! Now, I wasn't speedy Gonzales, but I did good! Who doesn't want to go to beautiful Naples in January when it is so cold here in Atlanta?! Not only do you get to challenge yourself but you get to raise money for an organization that is saving lives. That should be reason enough. I hope you'll join us! You can do that here. GO TEAM!